The EC-commisioned Science-Metrix study has a lot of interesting and useful information that I hope the EC will apply and use. Access Timing. The fundamental problem highlighted by the Science-Metrix findings is timing: Over 50% of all articles published 2007-2012 are freely available today. But the trouble is that their percentage in the most critical years, namely, the 1-2 years following publication, is far lower than that! This is partly because of publisher OA embargoes, partly because of author fears and sluggishness, but mostly because not enough strong, effective OA mandates have as yet been adopted by institutions and funders. I hope the Science-Metrix study will serve to motivate and accelerate the adoption of strong, effective OA mandates worldwide. That will narrow the gap at the all-important growth tip of research, which is its first 1-2 years. 1. Delayed Access. Publishers have essentially resigned themselves to Delayed Access — i.e., free online access 1-2 years after publication. They know they can’t stop it, and they know it doesn’t have a significant effect on subscription revenues. Hence the real battle-ground for OA is the growth region of research: the 1-2 years following publication. That’s why OA mandates are so important. 2. Embargoes. Most OA mandates allow an OA embargo during the first year folllowing publication. But there are ways that immediate research needs can be fulfilled even during an OA embargo, namely, via institutional repositories’ semi-automatic copy-request Button. For this Button to fulfill its purposes, however, OA mandates must require deposit immediately upon acceptance for publication, not just after a 6-12-month OA embargo has elapsed. There are still too few such immediate-deposit mandates, but the Science-Metrix study would have missed the "almost-OA" access that they provide unless it also measured Button-based copy-provision. 3. Green OA, Gold OA and Non-OA. It is incorrect that "Green OA" means only repository-based OA. Of course OA (free online access) provided on authors' websites is Green OA too. The best way to define Green OA is OA provided by other than the publisher: Gold OA is provided by the publisher (though often paid for by the author or the author's institution or funder). Green OA is provided by the author, wherever the author provides the free online access. (And, although it is not the kind of OA advocated or mandated by institutions and funders, 3rd-party "bootleg" OA, apart from being hard to ascertain, is also Green OA: it certainly doesn't merit a color of its own -- and probably a lot of the back access is 3rd-party-provided rather than author-provided.) So the Science-Metrix data would be more informative and easier to interpret if it were all clearly classified as either Green OA, Gold OA, or non-OA. That would give a clearer idea of the relative size and growth rate of the two roads to OA. 4. The OA Impact Advantage. I am sure that Gold OA would show the same OA impact advantage as Green OA if it were equally possible to measure it. The trouble is determining the non-OA baseline for comparison. 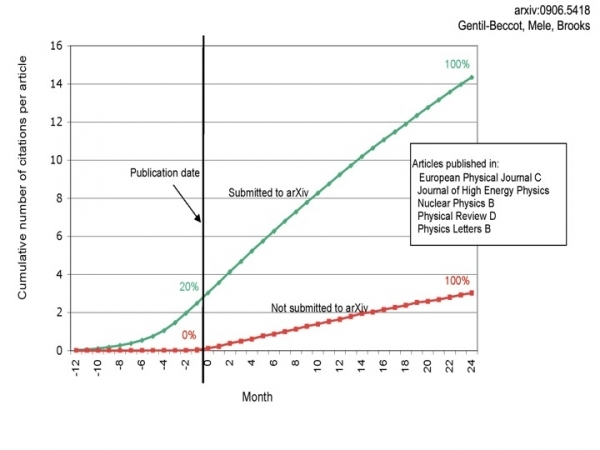 Green OA impact studies can do this easily, by comparing OA and non-OA articles published in the same journal issue and year; Gold OA impact studies have the problem of equating OA and non-OA journals for content and quality. And although there are junk journals among both non-OA and Gold OA journals, it is undeniable that their proportions are higher among Gold OA journals (see Beall's list) whereas the proportion of Gold OA journals themselves is still low. So their impact estimates would be dragged down by the junk-Gold journals. 5. From Fools Gold to Fair Gold. The Science-Metrix study is right that toll-access publishing will prove unsustainable in the long run. But it is mandatory Green OA self-archiving that will drive the transition to Fair-Gold OA sooner rather than later. Vincent-Lamarre, P., Boivin, J., Gargouri, Y., Lariviere, V., & Harnad, S. (2014). Estimating Open Access Mandate Effectiveness: I. The MELIBEA Score. arXiv preprint arXiv:1410.2926. P.S. I learned from Richard van Noorden's posting on this that the Open Access Button -- which names and shames publishers for embargoing OA whenever a user encounters a non-OA paper -- can now also email an automatic request to the author for a copy (if it can find the author's email address). This new capability complements the already existing copy-request Button implemented in many institutional repositories (see EPprints and DSpace), which is reliably linked to the author's email address. The purpose of the repositories' copy-request Button is to complement and reinforce institutional and funder OA mandates that require authors to deposit their final, refereed drafts immediately upon acceptance for publication rather than only after a publisher OA embargo has elapsed.